Most boat owners will quickly attest to the fact that things on boat break. They break quickly, and they break often. Fixing things is just a part of boat ownership. Of course, some things last longer than others. We are fortunate to have purchased Sea Gem from caring owners who, over the past 25 years, figured out what is built to last and what is not and equipped Sea Gem accordingly. Nothing lasts forever, especially on a boat, but we are fairly confident that everything on Sea Gem is built to last for about as long as is possible on a boat. Although Sea Gem has air conditioning, we don't run it all the time. It is costly to run the air conditioner when not plugged into the grid at dock, and when it isn't that hot outside, it is nice to open the windows and, when necessary, turn on the fans. We have lots of fans. Nine that I can think of at the moment: two in our stateroom, one in our head, two in the salon, one at the nav station, one in the bunk stateroom, and two in the guest stateroom. As it turns out, not all fans are created equally. At the nav station, we have one of those "soft touch" style fans. It is noisy and moves hardly any air. And I've touched it--it is not that soft. The only reason that it still works, no doubt, is because it has not had any use--because it is a lousy fan. 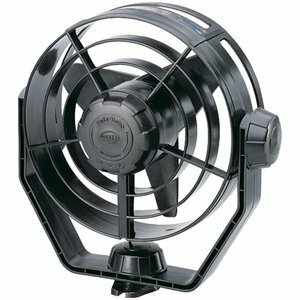 We have three other fans in the boat that move plenty of air, but are incredibly noisy. Fine during the day, but certainly nothing you can sleep to. Our remaining six fans are "Hella" fans. They are whisper quiet, move plenty of air, and draw almost no electricity. They can also be adjusted and locked in almost any position. And they last forever. For an interior fan on a boat, you could not ask for anything more. Last night, one of our six Hella fans died. I hit the switch to turn it on before we went to bed (it points from an opening port to the bed--an ideal position), it slowly turned a couple times, and then it stopped. I was tired, so I went to bed and hoped that it would fix itself over night. It did not. This morning, I checked the fuse on the dead Hella fan. Aha! The fuse was broken. I replaced it, and the fan immediately sprang to life. Well, sort of. In a sprang-to-life-means-spew-smoke-and-burn kind of way. I quickly turned the Hella fan off. It was officially dead. What is so great about a fan that breaks, you ask? First, that fan was probably used more than any fan in the boat. The knob was worn down with use. Second, it was probably more than 20 years old. The fan was stamped "Made in West Germany." It clearly did all that was asked of it and more. Fortunately, we have a spare Hella fan on the boat. It was probably purchased 20 years ago, too. Everything was in German. It had that 1980's style font on the price label. And, of course, it was proudly made in "West Germany." Five minutes later, it was installed and silently doing its job. I don't expect any problems for about twenty years. I just hope they (Hella?) still makes Hella fans then. Maybe we should stock up? They are whisper quiet, move plenty of air, and draw almost no electricity. They can also be adjusted and locked in almost any position. And they last forever. Commercial Electrician Perth used in our homes and industrial areas.